I grew up in a house of scones. Scones – my mother’s large, golden, sultana-flecked scones – were, and are, the warm and butter-soaked answer to everything, even those questions you never knew you were asking. Post wedding party? Scones. Saturday morning tea? Scones. Funeral? Scones. Family member unwell? Scones. Work lunchtime? Scones. Baby just born? Scones. Heading back to Dublin after the weekend? Scones. She is the never-measure, whip-it-up-in-a-flash queen of scones and, as a result, I never bothered making them myself. Until I moved to New Zealand and my scone tap was turned off. A long, long way from home, I discovered Australian cookbook author Stephanie Alexander’s rainbow-striped doorstop of a book, The Cook’s Companion. It taught me how to cook on the other side of the world, gave me ideas for unfamiliar ingredients like (feijoa, crown pumpkin, silverbeat) – and introduced me to date scones. Not the same as my mother’s – they could never be the same! – but still scones, still familiar, still a (date-enhanced) taste of home. Cookbooks are like that. They take you places that you never expected to go. While I lived in New Zealand, I attended a food conference where I was inspired by hearing Stephanie speak passionately about the importance of edible education for kids. That talk was something that I took to my heart; since then our two little girls have grown up knowing exactly where their food comes from, between feeding, plucking and eating our own turkeys, having doorstop chats with the hens and sowing and growing their own patches of vegetables. Years later, I was reduced to an awe-struck babbling fool when I was fortunate enough to meet her at the first Kerrygold Ballymaloe Litfest of Food and Wine. Stephanie Alexander – from a scone recipe, to an inspirational heroine, to someone standing right there in front of me. Food is like that. It takes you places you never expected to go. 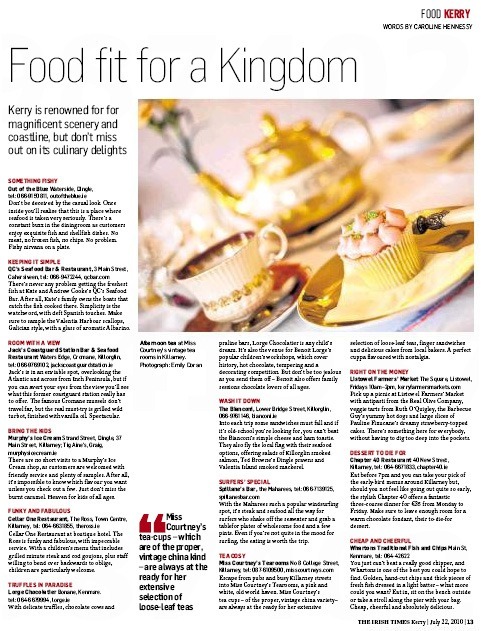 This year the Kerrygold Ballymaloe Literary Festival of Food and Wine takes place from 20 to 22 May. There will be cookery demos from restaurant stars like Yotam Ottolenghi and Ramael Scully of Nopi, Violet Bakery’s Claire Ptak, Eric Werner and Mya Henry from Hartwood, a jungle-based Mexican restaurant that works with no walls and no electricity. Lebanese food activist Kamal Mouzawak will discuss food in a warzone, Anya Von Bremzen gives an insight into Mastering the Art of Soviet Cooking and Prannie Rhatigan will forage for seaweed. There’s a Drinks Theatre, featuring brilliant wine writer Jancis Robinson, along with gin, cocktails, whiskey, cider – and beer. That’s me and English beer writer Pete Brown, Sunday morning, talking and tasting IPAs. Are you interested in doing some food writing for yourself? Make sure you sign up for the UCC food writing workshop on Friday and bookend the weekend with a Lens & Larder-hosted discussion of food styling and photography. Prices start at €5 for entry to the Big Shed and fringe festival events, with tickets for talks starting at €16. Peruse the website at litfest.ie with a cuppa and one of these Stephanie Alexander-inspired date scones in hand. 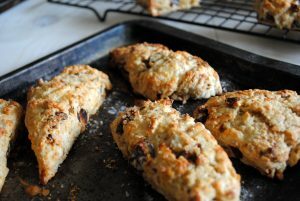 I’ve taken inspiration from Stephanie Alexander, incorporated a Darina Allen scone recipe and revised the whole lot to include a few tricks from my mother. Preheat the oven to 230°C (210°C fanbake). Sieve the flour and salt into a large mixing bowl. Cut the butter into cubes and rub in until the mixture resembles large breadcrumbs. Add the sugar, dates and nutmeg and mix well. Beat the egg in a bowl with the milk, add to the dry ingredients and mix into a soft dough. Knead together quickly, turn onto a floured work surface and pat out into a 2cm thick round. I cut these into wedges and squares so they don’t get mixed up with normal scones! Place on a floured oven tray, brush with egg or milk and sprinkle with some demerara sugar. Bake in the preheated oven for 12-15 minutes until golden brown. Best split, buttered and eaten while still warm. Eat with jam – raspberry or blackcurrant for preference – or with slices of a crumbly, mature cheddar cheese. Makes approximately 10 large scones.